I am livejournal illiterate and couldn't figure out how to post these for mossmorton without starting a new thread. 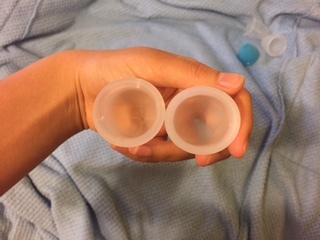 Si-bell on the left, Organicup on the right (both small). You can see that the Organicup is straighter in the body and more tapered at the base. Organicup towards the front of the photo, Si-bell towards the back. You can see that the Si-bell has a slightly larger diameter. Si-bell on the left, Organicup on the right. 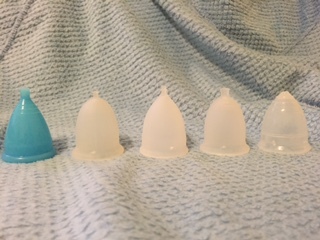 For reference: from left to right, Cuplee, Si-bell, Organicup, Fleurcup, and Yuuki (soft), all are small. Wow, these are great! Thanks for doing it. I think I'm going to get an Organicup. 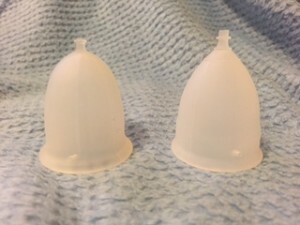 I liked the Si-bell for it's softness and comfort, but didn't love the stem and it was too rounded for me and hard to grip & would often ride up, I think because of the round base; I guess I prefer more V shaped cups. 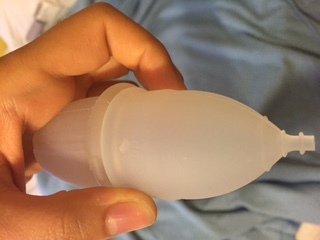 The Lunette is pretty good, but a bit firm and a little too bulbus shaped in the middle. Based on your issues with the Si-bell, I think the Organicup is a good bet. It was easier for me to remove. I cut my stems off, but from what I can remember, the Organicup stem seems like it would be better for someone who needs a stem to aid in removal. Organi is my favourite small cup! I had the large and didn't like it as much, but I hear they've changed the large's design since I bought mine.